Fifteen years after starting a charter high school in Tucson, Arizona, Carrie Brennan ’88 is returning to the Upper Valley as head of school at Thetford Academy, an independent 7-12 school in Thetford, Vermont. Deborah Hogan, professor of microbiology and immunology at the Geisel School of Medicine, was elected as a 2019 Fellow of the American Academy of Microbiology — the honorific leadership group within the American Society for Microbiology. At least three Dartmouth professors and 18 students, nearly all people of color, have been targeted by a slew of emails that contain sexually explicit descriptions and racial slurs. 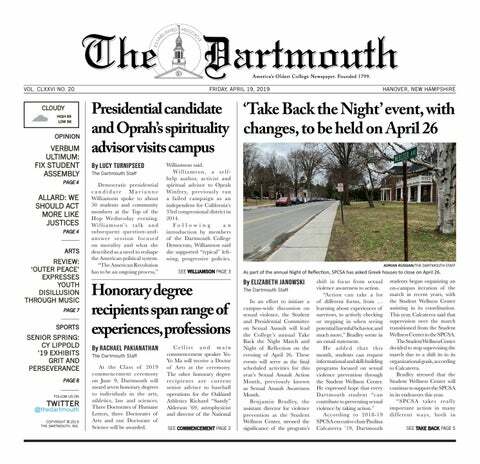 The emails came from false email addresses and claimed to be from Dartmouth students. In 1923, the College introduced a new dimension to the Winter Carnival — a beauty pageant. Fittingly titled “Queen of the Snows,” the competition inspired flocks of young and beautiful women to trek to the frigid campus.